How did fire come about? FIRE- A friend or a fiend? Every year thousands of children die in fires. Most of these deaths are the result of children playing with fire. To prevent these deaths, matches and lighters should always be kept out of reach of small children. The safest location is in a locked cabinet. Adults and older children should keep a watchful eye for misplaced matches or lighters. Talking to children about fire is important. If children find matches or lighters they should tell an adult to put them away. 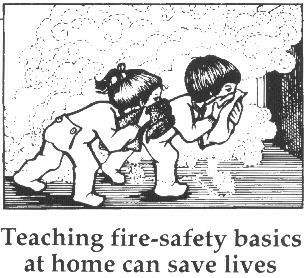 It is very easy to accidentally start a fire; small fires can grow into big fires very quickly. If a fire is accidentally started, tell a grown-up right away. Never try to fight the fire themselves. Never hide or run away without telling someone. Mail us if you need our professional help!! !